Ryan Shontz returns for his sixth season as the head coach of the Pymatuning Valley Lakers boys’ basketball team. The Lakers finished 12-12 a year ago. Returning for Pymatuning Valley this year are: Nick Sapp, Jacob Saxion, Austin Roberts and Jonah Wilkerson. Also, expected to see a lot of playing time for the Lakers this year are: Cole Owen, Logan Drnek, Tanner Rhoades and Noah Wilkerson. “We’ve been up and down so far. We had a scrimmage this past week and we’re not ready yet but we’re ahead of schedule,” Shontz said on how practice is going. Pymatuning Valley has a trend of giving up more points on offense the past several season. One of their main goals is to play better defense and pay more attention to detail on defense. “We want to maintain a high level offense, while slowing down other teams on defense,” Shontz said. Pymatuning Valley have had a least a share of the NAC title the last three years. It would mean a lot for the senior class to win at least a share once again. “Our goal is to compete for the conference champs and our second goal is making a run in the play-offs,” Shontz said on the teams goals. The Lakers start the season Dec. 4th against Edgewood. 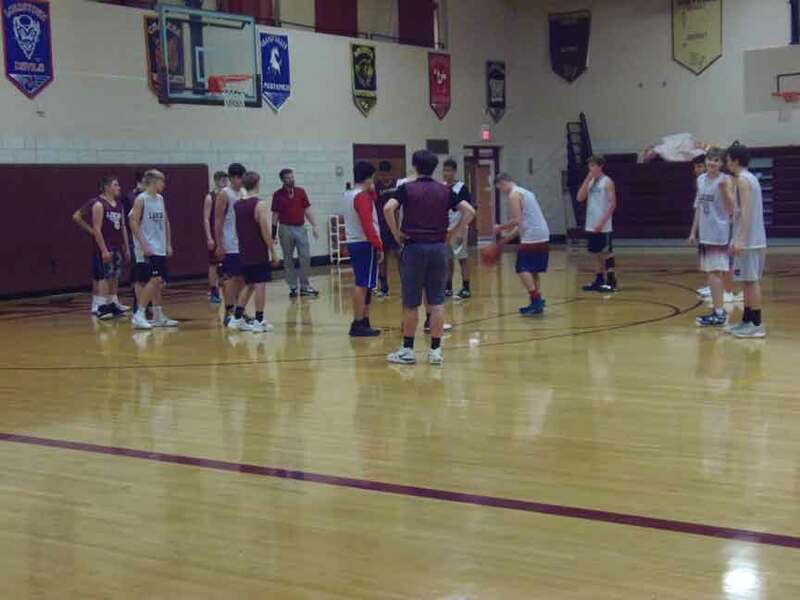 Pictured: The Pymatuning Valley Lakers practice for the upcoming season.